My friend Rex Hammock wants to know what Yahoo! 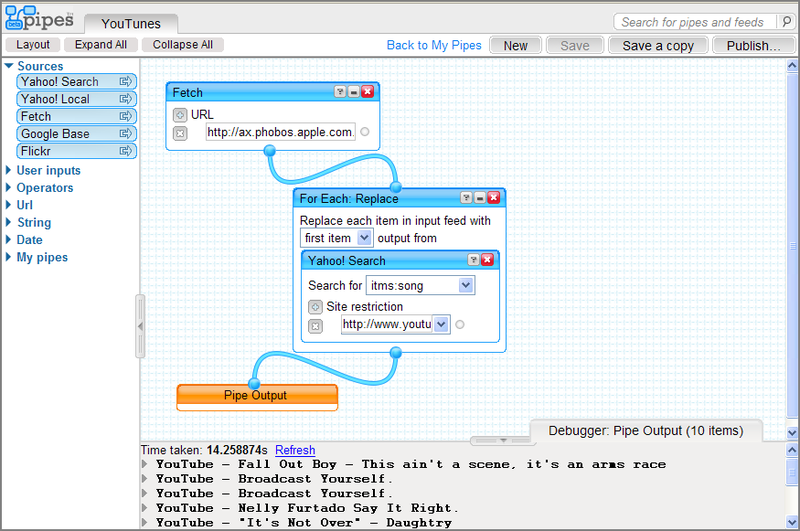 Pipes is all about, so I whipped up a simple example "pipe" to show how it works. First I dropped a fetch source module onto the canvas, and told it to use the iTunes Top 10 Songs feed as the source. Next I added a for each: replace operator module, which takes an input feed and replaces it with output from another feed. In this example, I used the iTunes feed as the input and a Yahoo! 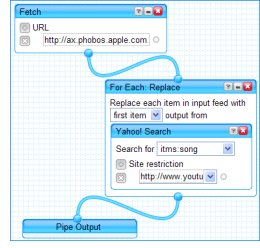 search feed as the output. The final step was attaching the "for each" module to the pipe output. It's not perfect - it needs additional filtering to weed out irrelevant videos - but I wanted to keep it simple for this example. If you'd like to check out the actual "YouTunes" pipe, you can find it here (or just subscribe to its RSS feed). PS: Here's how the RSS feed for this pipe looks in FeedDemon (it would look a lot better if I could figure out how to insert Media RSS thumbnails into the feed). What a great sample pipe and thanks for your kind words. I'd encourage you to add a description and tag it "example" so that others are more likely to find it. You could also conceivably use feeds from sites like Sonicliving so that it's showing YouTube videos of YOUR top 10 or upcoming concert acts. Even though it's coming from youtube, it won't output in MediaRSS? Is that a GooTube issue, or a Pipes restriction? Glad you like it, Kevin! I'll tag it as an "example," as you suggest. Critter, this pipe uses a Yahoo! 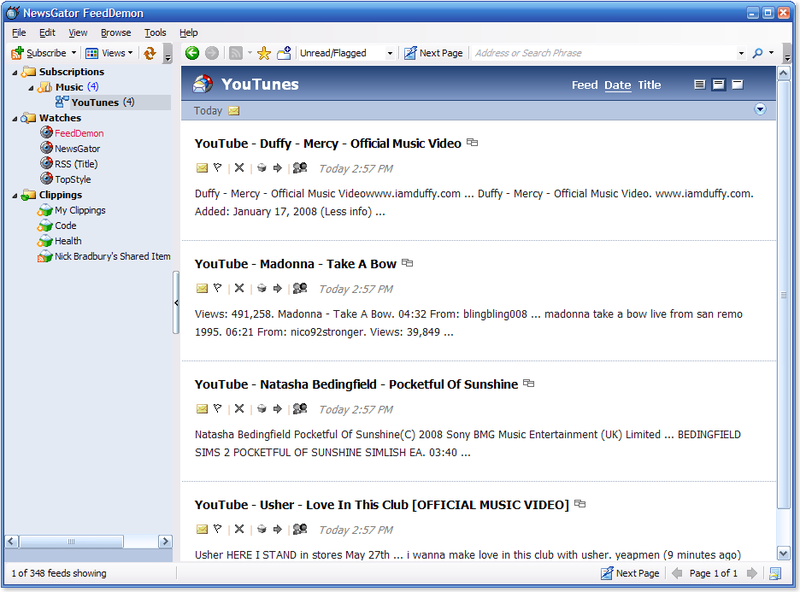 Search of YouTube.com, so the MRSS information isn't available (ie: I'm searching YouTube's site, not their feeds). However, I could use the artist name from the iTunes feed to create a YouTube feed of that artist, and that would contain the MRSS information (provided that Pipes doesn't strip it). Dave, that "Google Music Video Search" module is pretty handy - thanks for sharing it! This enabled me to do the same thing for the UK top 40! Please let me know, if figure it out. I have sent feedback/request to Yahoo guys several times, have not heard back.. I've been playing around with this too. I've found YouTube tag search to be quite good at producing RSS, but had much better luck with Google Video.